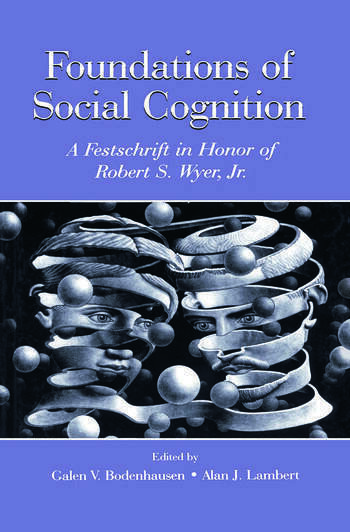 A tribute to Robert S. Wyer, Jr.'s remarkable contributions to social psychology, Foundations of Social Cognition offers a compelling analysis of the underlying processes that have long been the focus of Bob Wyer's own research, including attention, perception, inference, and memory. Leading scholars provide an in-depth analysis of these processes as they pertain to one or more substantive areas, including attitudes, construct accessibility, impressions of persons and groups, the interplay between affect and cognition, motivated reasoning, and stereotypes. Each chapter reviews and synthesizes past scholarship with the assessment of current understanding and cutting-edge trends and issues. A "must have" for scholars, researchers, and advanced students in the fields of social and cognitive psychology, as well as those in related fields such as consumer, organizational, and political psychology, neuroscience, marketing, advertising, and communication. Contents: G.V. Bodenhausen, A.J. Lambert, Introduction. W.J. McGuire, The Morphing of Attitude-Change Into Social-Cognition Research. Part I:Elements of Social Cognition. D.L. Hamilton, L. Garcia-Marques, Effects of Expectancies on the Representation, Retrieval, and Use of Social Information. N. Schwarz, H. Bless, M. Wänke, P. Winkielman, Accessibility Revisited. F. Strack, T. Mussweiler, Heuristic Strategies for Estimation Under Uncertainty: The Enigmatic Case of Anchoring. Part II:Perceiving Persons and Groups. D.E. Carlston, L. Mae, The Accidental Tourist: Capturing Incidental (Versus Intentional) Impressions. G.V. Bodenhausen, C.N. Macrae, K. Hugenberg, Activating and Inhibiting Social Identities: Implications for Perceiving the Self and Others. S.J. Sherman, A.L. Johnson, Perceiving Groups: How, What, and Why? A.J. Lambert, A. Chasteen, B.K. Payne, Finding Prejudice in All the Wrong Places: On the Social Facilitation of Stereotypes in Anticipated Public Settings. Part III:Motivational Contexts of Social Cognition. E.T. Higgins, D.C. Molden, How Strategies for Making Judgments and Decisions Affect Cognition: Motivated Cognition Revisited. D.A. Gruenfeld, D.J. Keltner, C. Anderson, The Effects of Power on Those Who Possess It: How Social Structure Can Affect Social Cognition. N. Wyer, Value Conflicts in Intergroup Perception: A Social-Cognitive Perspective. "Any reader of this book cannot help but become aware of the great debt the field of social cognition owes to one Robert S. Wyer, Jr.... a coherent, integrated, and comprehensive treatment of contemporary social cognition research; its chapters written by leading scholars with scholarship, historical sweep, and flair. If someone asks you 'What is social cognition?' hand her this book." "...represents cutting edge social cognition at the beginning of the new millennium."